This entry was posted in Uncategorized and tagged Cheese, cooking, food, French, Ham, Souffle by christao408. Bookmark the permalink. That looks like a major success — your first attempt? Not being a souffle expert, what makes the thing rise? The steam of the filling? I think the rising and collapsing would make a good video. Chris, this is just too terrific. Neiman Marcus in St. Louis serves this, with different combinations and not just ham and cheese, and truly it does not look as good as you have it here. wow! Look good to me – save me some! I would think the ham would have added enough salt. I’ve never tried souffle before. Cool! I’ve never had a souffle of any variety, and that looks pretty awesome. What IS a souffle? I don’t understand! What does it taste like? What is the texture? 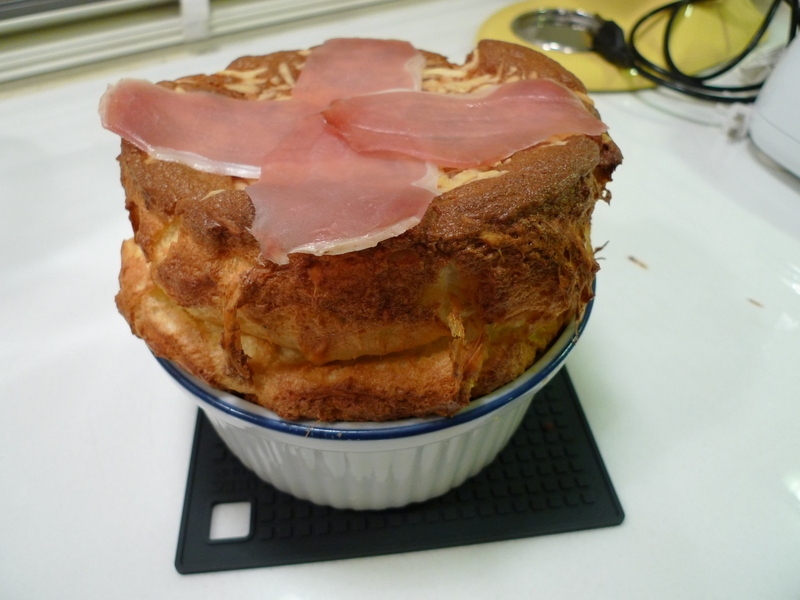 Wow – very impressive…….. Souffle’s have always been one of those things that I’ve put in the ‘too hard basket’ to make. @venice – The funny thing is, they are actually pretty basic. I was intimidated by them for a long while but as I’ve made more of them, I’ve discovered that there isn’t that much too them. @secade – @beowulf222 – A souffle, most simply described, is an incredibly airy cake. It can be sweet or savory. The cake part is a batter made of butter, flour, and egg yolks. In this case, I incorporated shredded cheese but you could include chocolate, fruit puree, or many other things. Separately, you whip egg whites until they form stiff peaks. Then you gently fold the egg whites into the batter, making it light and foamy. When you bake it, the air in the millions of bubbles expands, causing it to rise and forming this very light sponge. @epiginoskete – @ElusiveWords – Really? You haven’t tried a souffle before? That’s something that must be corrected! =D@rudyhou – You know where to get it. =P@slmret – Actually, I’ve made souffles probably two dozen times. It isn’t your every day dish, though, and I hadn’t made one in about a year. @Inciteful – It really puffed up high. Of course, as soon as you take it from the oven, it starts deflating… =(@Fatcat723 – This particular ham was smoked and wasn’t all that salty, actually. I had thought the same thing and held back on the salt. @ZSA_MD – Oh, I’m sure theirs is many times better. Practice makes perfect, as they say! Your souffle looks absolutely amazing! Mmm..
@christao408 – I agree! I enjoy cooking, though I don’t devote a lot of energy to it — now and again I’ll gather ingredients and try something new — and a souffle is on my “Sometime I Want To Make That” list. Thanks for all this food-related inspiration. @epiginoskete – You’re so welcome. @mizz_chan – @Vitamin_D – Thank you, thank you. @yang1815 – True, and we did end up sprinkling a bit of salt on it at the table, which was fine. @murisopsis – Thanks – even though taking pictures through an oven window doesn’t turn out well, I really enjoyed the transformation of the dish. That’s the type of thing that could inspire someone to try their hand at it! yum! i’ve never had a souffle or tried to make one… i’ve heard that it can be temperamental. any tips to keep it from falling? That was a beautiful souffle! @kunhuo42 – I think a lot of that is kind of comedic urban legend- you know, the slamming door causing it to fall or the chef having to tiptoe around the kitchen. 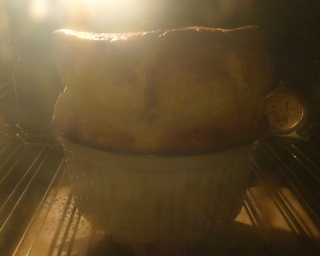 A souffle is going to start falling as soon as it is removed from the oven. You will have a few minutes (picture time!) when it is still pretty tall, but the collapse is inevitable. Meanwhile, if you keep the oven door closed for the first 20-25 minutes of the cooking, that should ensure it isn’t interrupted, causing any premature deflation. (Sounds like a medical condition…)@SistahWarhol – Thank you. @CurryPuffy – Yes, will you include Bangkok in your Hong Kong trip this December? I know that Nick is trying to coordinate a meet-up in HKG while you are there. @CurryPuffy – Oh, he won’t be in HKG, too? What a shame! Well, I’m all for a meet-up and if we start planning now, I can make sure we’ll be there. Would you suggest being in HKG on New Year’s Eve? We could always go the week prior to that and then head back to BKK a day or so before NYE. @christao408 – That sounds quite similar to making an angel food cake! IS there much of a difference? Angel food cakes are my absolute favorite thing to bake, and I love experimenting with new flavors and textures, trying to make the best texture. I was getting pretty good at it! @secade – Significant difference. Angel food cakes are heavier on the flour and made with whipped egg whites only. Souffles have much less flour, have milk or cream, and many, many whole eggs. This looks amazing! I always wanted to make souffles! I’m great at making molten hot chocolate cakes, but never tried souffles. 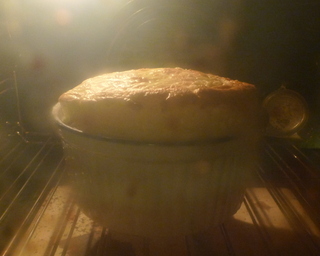 Is it hard getting a balance between not burning the souffle and making sure that it rises? @chocolatecouture1226 – You should definitely try – making souffles is easier than it looks. 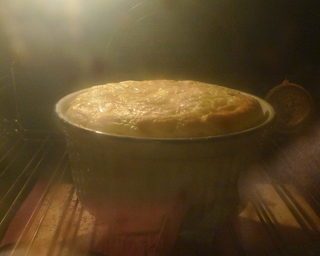 As long as you have whipped the egg whites, the souffle will rise. And you have to really, really overcook it to get it to the point of burning.